Adobe's multimedia Flash technology is at the heart of a growing feud between Adobe and Apple--and that feud will soon get a lot hotter, if the latest reports are correct. The two companies are at odds over the use of Adobe's Flash technology on Apple's iPhone and iPad. Flash allows developers to create Web sites with interactive multimedia presentations and interfaces, and allows you to view them from your browser. Apple's iPhone has never offered Flash support, and, despite the wishes of many iPhone and iPad users, the feature was not added to the latest iPhone OS, version 4.0, which was unveiled last week. In fact, the new iPhone OS takes steps to prevent the use of Flash on Apple's devices, as it introduced measures that would prevent app developers from using Adobe's Flash-to-iPhone app compiler. That compiler is included in Adobe Flash CS5, which was introduced this week. 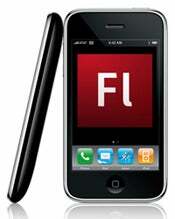 The tool would allow developers to make iPhone apps in Flash and them export them as an iPhone app. But in anticipation of this, Apple banned all third-party iPhone app compilers via a new developer agreement enforced last Thursday. The move to block developers from using Flash to make apps for the iPhone and iPad has incited anger among many industry watchers. "Go screw yourself Apple," wrote Lee Brimelow, an Adobe platform evangelist, on his personal blog, in response to Apple's tactics of blocking Flash on the iPhone platform. The iPhone app packager in Flash CS5 was a major feature in the new software, and is believed that Apple's move to ban its use could affect sales of the package. A report from ITWorld, a sister publication to PCWorld, even suggests that Adobe will go so far as to sue Apple. Steven Vaughan-Nichols quotes in his ITWorld report sources close to Adobe saying the company will be suing Apple within a few weeks because of Apple's determination to keep Flash out of iPhone OS. Adobe didn't have any official statements about such a suit, and the report cannot be verified. But, even if it's just a rumor, it illustrates the growing tensions between the two companies. Stay tuned.